It is certainly true that a picture is worth a thousand words when it comes to news photographs, and it’s especially true of news photographs from war zones. One of the famous photos from the war was a 1968 Eddie Adams photo for the Associated Press showing a general shooting a Viet Cong fighter in the head with a pistol on a Saigon street. That picture became the left’s rally poster for American withdrawal from Vietnam. Adams won the Pulitzer in 1969 for his Vietnam photos, but he regretted the unintended consequences to his dying day. As he wrote in Time magazine, "The general killed the Viet Cong; I killed the general with my camera. Still photographs are the most powerful weapon in the world. People believe them; but photographs do lie, even without manipulation. They are only half-truths." Now photographers are going beyond half-truth, to manipulating images that aren’t at all real. Reuters – the London-based wire service that aroused American ire in 2001 for refusing to describe the 9/11 attackers as "terrorists" (they said the word "adds little" to the story) – has come under fire for distributing a photo of smoke rising from Beirut suburbs on August 5. Over the weekend, bloggers quickly suspected the photo was a crudely enhanced phony, that it had been "Photoshopped," manipulated by computer software. Internet message boards of photographers quickly agreed. By Monday, Reuters admitted that its top editors had distributed a pictorial hoax. They not only withdrew that photo, but their entire Internet archive by the responsible photographer, a Lebanese freelancer named Adnan Hajj, who had worked from them since 1993. 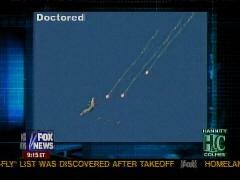 Then bloggers found a second doctored Hajj photo, of an Israeli F-16 firing "missiles" in southern Lebanon. The plane had dropped a flare as a decoy, but only one flare: Hajj added in two phony flares. Reuters severed their relationship with Hajj and declared they had "zero tolerance" for doctored photos. They took the right public-relations steps to control the damage, but this doesn’t get Reuters editors off the hook. They should have caught this manipulation and they should have prevented this picture from emerging with their brand on it. In a statement, Reuters claimed the two altered photos were among 43 Hajj had filed "directly to the Global Pictures Desk since the start of the conflict on July 12 rather than through an editor in Beirut." But the New York Times reported a senior Reuters editor claiming it was not a mistake made at the top. "On Saturday, we published 2,000 photos," Paul Holmes said. "It was handled by someone on a very busy day at a more junior level than we would wish for in ideal circumstances." These shifting stands do not excuse how even photographic amateurs could quickly deduce that the phony-smoke picture was about as believable as a three-dollar bill – and then caught a second doctored photo. There was clearly an agenda here. A look at Adnan Hajj’s pictures from Lebanon (and the captions written for them) packed an obvious emotional punch against Israeli aggression. This is ironic, considering the official Reuters distaste for "emotive terms" like terrorism: "Some Reuters coverage, including pictures and video, is of wars or conflicts during which all sides are actively promoting their positions and arguments. We are committed to reporting the facts and in all situations avoid the use of emotive terms." But they’re obviously committed to very emotive photographs of dead babies, as Hajj took in the controversial bombing of civilians in a Qana apartment complex. Perhaps the phoniest part of what the bloggers call "Reutergate" is the Reuters declaration that they are the perfect picture of objectivity. "We do not take sides and attempt to reflect in our stories, pictures and video the views of all sides. We are not in the business of glorifying one side or another or of disseminating propaganda. Reuters journalists do not offer their own opinions or views." Anyone who has read Reuters in recent years can see the comedy in that statement. One 2002 photo caption lamented: "Human rights around the world have been a casualty of the U.S. ‘war on terror’ since September 11." In 2003, the day before Baghdad fell, Reuters reporter Greg Frost casually compared Saddam’s withdrawing guerrilla forces to colonial soldiers in the American Revolution. Within days of Saddam’s capture that December, Reuters began a dispatch with this supposedly non-opinionated sentence: "Joy at the capture of Saddam Hussein gave way to resentment toward Washington Monday as Iraqis confronted afresh the bloodshed, shortages and soaring prices of life under U.S. occupation." So when the major media tell you that they would never manipulate a word or a picture to press their own political agenda, it’s always best to check the fine print – and the fine pixels of newfangled digital photography.